Nigeria's President Muhammadu Buhari greets his supporters during a campaign rally ahead of the country's presidential election in Rivers State, Nigeria, Feb. 12, 2019. Two men in their 70s are candidates in the Nigerian presidential election on Saturday. Yet half of the country’s registered voters are young people between 18 and 35 years of age. The two men are well-known to voters. It is the fifth election campaign for President Aisha Muhammadu Buhari, who was a military ruler in the 1980s. Buhari, now 76 years old, is seeking re-election as president. This is the fourth campaign for Atiku Abubakar, the main opposition candidate. Abubakar, now 72, was vice president from 1999 to 2007. The presidential election offers little hope of change for young people in a country where nearly 25 percent of the workforce is unemployed. Some fear anger over the lack of jobs may lead to violence. In Abuja, the Nigerian capital, student Dorcas Nathaniel is making plans to vote for the first time. "I should be happy, but I'm not happy because the two candidates aren't what I expected," she said. Nathaniel added that she had hoped at least one of the candidates would have policies she could support, but neither did. At 20, she is in the under-35 age group that makes up 51 percent of Nigeria’s 84 million registered voters. Anyone seeking an alternative candidate is less than happy. The two main candidates are well-known, older Muslim men from northern Nigeria. The similarities between the two are largely because of an unofficial power-sharing agreement between the country’s north and south. Under the deal, the position of president alternates from one area to the other every two four-year terms. It is now the turn of the mainly Muslim north. There are more than 70 other presidential candidates. Yet they lack the financing available to Buhari and Atiku. The money comes from the All Progressives Congress and People's Democratic Party. The two parties have governed Nigeria since military rule ended in 1999. The two men have also developed patronage systems after many years in politics. John Sunday is a 23-year-old student who lives in a poor neighborhood called Makoko. He said many people there were more interested in getting money from political parties than choosing their favorite candidate. "People are after money. They're not after the future of their children. They are selling their votes," said Sunday, a political science student. "Vote buying" is not new, but Sunday said for many people in the poor areas, life is getting more difficult. Among those aged 15 to 35, more than 55 percent are either out of work or not in full-time jobs. Nationwide inflation reached a 7-month high of 11.4 percent in December 2018. Cheta Nwanze is the head of research at SBM Intelligence, a service that provides advice to politicians. He said that poverty and higher living costs were a cause of violent crime as young men tried to make money outside official employment. He said, "The economy isn't growing anywhere near enough to support them. When you have such a situation, the outcome is that all sorts of people will rise up to fill in the gaps." Nigeria's security forces face violence within communities over land use. Nigeria also has a history of violence at election time. This unrest can sometimes involve criminals paid to frighten voters. It also can result from public anger at fears of voting corruption. Human Rights Watch reported that, eight years ago, more than 800 people died in election-related violence. The 2015 election of Buhari was comparatively peaceful, however. Buhari and Atiku have both sought to consider the needs of those unable to find work in an economy struggling to recover from its first recession in 25 years. The president said the expansion of a nationwide vocational skills program could create more than 15 million new jobs. He also said education was a concern. He promised to retrain teachers in subjects like science, technology and mathematics. 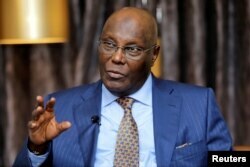 Atiku wants to expand the influence of private business to create jobs. These include promises to privatize the state oil company and spend $25 billion to support private business investment in the country. Alexis Akwagyiram reported this story for the Reuters news agency. Susan Shand adapted the story for VOA Learning English. George Grow was the editor.